A safe drinking water lesson may not be high in importance for many, but safe water is a critical need for many people. My youngest son was born in a country where access to safe drinking water is a challenge. There is progress being made and I’m so happy to see positive changes not only in his homeland but for people in all corners of our Earth. Recently we were discussing water safety and I decided to make it into a hands on experience for the kids. 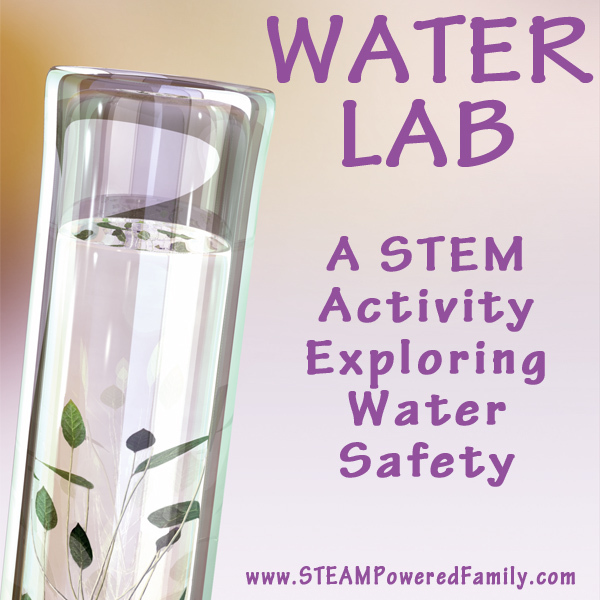 Here is how we did our Water Lab and our safe drinking water lesson. Our first step was to collect our water samples. I asked the boys where they would get their water from. They answered: the tap or bottled water. 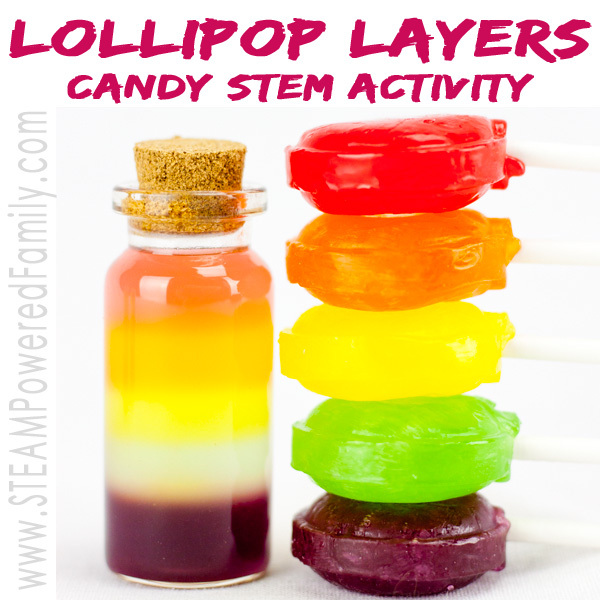 We took some sterilized jars and collected our samples. Next up I challenged them to think outside the box and imagine that we are out of water. The taps aren’t working and we have no bottled water, where could they go to get water. They answered our rain barrels. So we went outside and collected a sample from our rain barrels. We discussed how there was only a limited amount of water in our rain barrels so eventually those would run dry, then where could they get water? They answered the lake in our neighbourhood. So off we went on a beautiful walk to collect a sample from the lake. 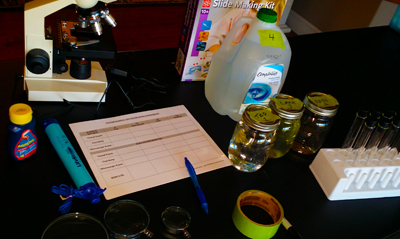 I made up a quick worksheet to document our findings, then we started our examination of our water samples. 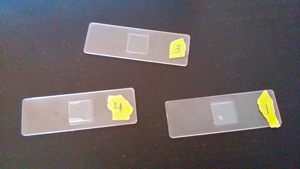 Our first step was to line up our samples and do a quick visual examination. The first thing we noticed was that our lake sample included a pet. We call them Lake Shrimp but their proper name is Copepods. They are fresh water crustaceans and super fast! It was so hard to snag a photo. The lake water also had lots of floaties in it and appeared a little yellow in colour. The other three samples looked pretty much the same. Using our awesome new test tubes and test tube stand, we transferred some of the water into test tubes and did another visual examination. 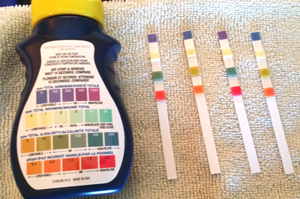 Next we took some water test strips that we use to test our hot tub water and tested each of the samples. We documented our results and it led into a great discussion about pH, hardness, and alkalinity. Our Basher Chemistry book came in really handy to answer all the boys questions. We documented all of our results on our worksheet. Our tap, bottled and rain water all had similar results, which frankly surprised me. I thought our rain water would not be quite as good as it came out, but perhaps that is a reflection of where we live? The lake water though, had a very high pH, hardness and alkalinity reading. Next up we prepared some slides using our slide making kit. Then examined them under the microscope. 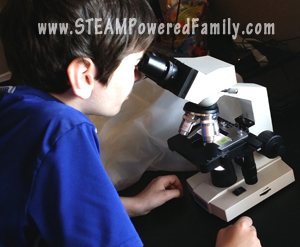 My boys LOVE using the microscope and always get really excited when we pull it out. For younger kids getting a microscope that sends your images to a computer is fantastic! It also really helps with your lessons. This is where things got really interesting. The tap and bottled water came up clean, but we did see a few little tiny black and green things in the rain water. So maybe it wasn’t so clean and safe! Then things got really exciting with the lake water. It was filled with algae that appeared as segmented, green spirals plus round clear disc objects. We also saw a teeny tiny bug swimming around on our slide! It was really neat to see the cell structures of the algae and tied in nicely with some other science studies we have been doing into cells. At the end I asked the boys which water they would drink, both of the boys said either tap or bottled water. Then we chatted about the importance of filtering other sources of water and how something like our LifeStraw is so important to use if we ever do need to drink found water. They also understand now why it is so important to help people everywhere in the world get access to clean, safe drinking water. A very successful and interesting lesson! 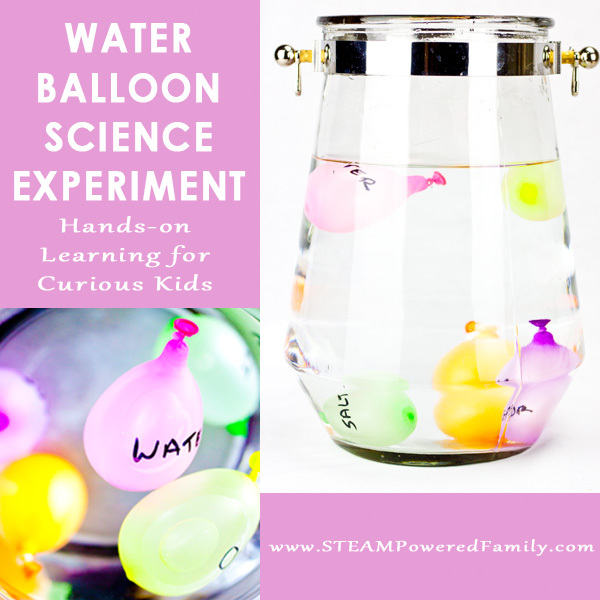 Have you done a Water Lab? 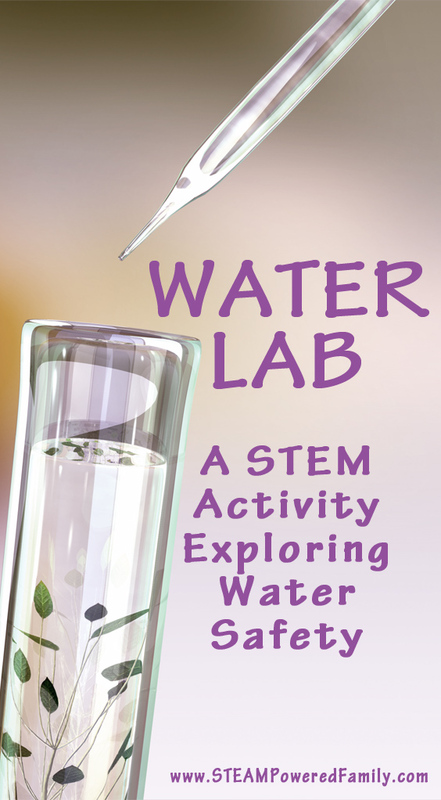 I like the little water lab that you have created. 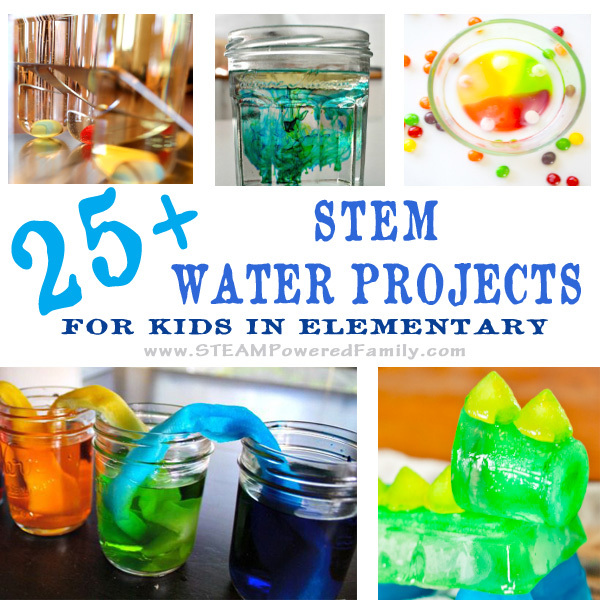 I think it helps show children about the water and how we need to make sure the water is safe before drinking. Luckily we have this on a much bigger scale so that our water we drink isn’t contaminated.